Congratulations to, drumroll, please, the winner, KAT KENNEDY, by random draw, of the two balls of Regia Sock Yarn!!! WOOT! I hope to see a sock-in-progress at Fenway, m’lady! I love this! Speaking as a person who is sometimes in similar V.I. type situations, my tried-and-true buddy knitting-in-my-pocket go-everywhere thingie is TaaDaaYaHAA: a SOCK! Janna: “How did I not realize V.I. was turning 50? Because I’m turning 50 on Sunday – it makes me feel a little better to know V.I. is 50, too, because she is so, so cool. And of course, she has to have several WIPS: When she’s home, she’s knitting Rainbow Bright Dog Collars and Leashes (from the April issue of Magknits) for Peppy and Mitch; for Mr Contreras she’s knitting a vest from Knitty (Petrol) to keep him warm and cozy during your cold Chicago winters. Oh, and she’s knitting Clapotis for Lotty. Well, Queer Eye for the Straight Guy ain’t got nothin’ on us. Just for grins, we’re going to stage a little reality show of our own. We’re going to make-over many of the ideas we hold about patterns and knitting. If your mail to me is any indication, you want to know EVERYTHING there is to know about SIZE. From re-sizing to my-sizing, the questions fill my inbox to overflowing. In our show, no one wears ill-fitting clothes! 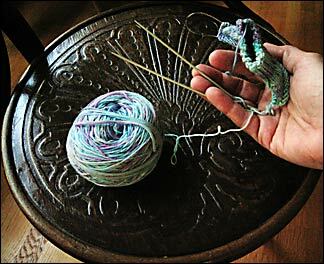 (Especially ones that come off their own needles…) Sleeves are long enough and have the right amount of ease. Length and structure of the torso pieces flatter and enhance whatever Mother Nature blessed us with. Whether you’re a twig or an elegant oak, your clothes do not bind, gap, or ride up. If you have a bountiful bosom or a shapely long waist, your knitted garments can mold to your frame as if Da Vinci himself stroked you on a page. RealityKnits Episode #1: Whose Size is It Anyway? Fashion sizing seems to be the 4th dimension. Even Einstein would agree that off-the-rack sizes never actually match commercial knitting patterns with any kind of standards or regularity. Commercial sizes don’t even match between price points or manufacturers. It is unreal. Many of us have totally trusted our regular size when choosing a pattern size for a garment we want to make but have found ourselves with an armful of awful after hours of knitting what we thought was going to be a masterpiece. I have had fabulous disasters just blindly following a knitting pattern in *my* size according to the retail clothes I owned. My personal disaster *best* is a sweater I re-knit 3 times! (YES, I am STUBBORN!) AND it still isn’t right – the sleeves are too big and the body is tight. Ce la vie! Measure each of the indicated areas and write in the numbers next to the areas of the body on the drawing. Go HERE, a page masterminded by the Craft Yarn Council of America, to get information about how you should measure these areas. The info we want is on the right. If you look closely, you will see each is differently sized than the other. The Pullover is larger than the Shell. The Cardigan is bigger than both. They all function differently in your wardrobe and need to fit in slightly different ways. In the design world, this is called *EASE*. It describes how tight the garment fits to your frame. Shells have the least ease or are “very close-fitting”. Cardigans have the most ease because they usually go over other clothing or are “standard to loose-fitting”. Pullovers are inbetween; usually we like them to be more “close-fitting”. AND, go get from YOUR closet a shell, a pullover, and a cardigan. Pick the ones you think fit you the best. 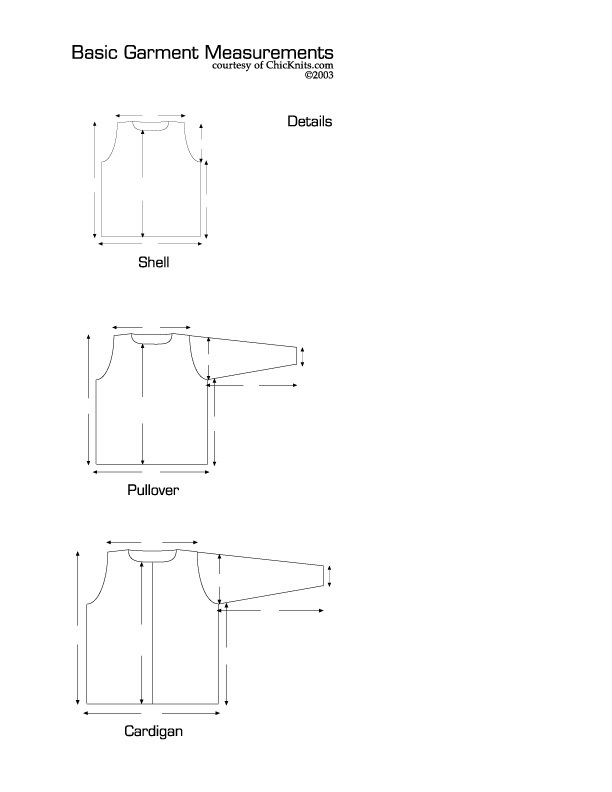 Measure the areas on these garments that are indicated by a double tipped arrow on the Picture Printout. Write your numbers into the little spaces provided to the nearest half-inch or whole inch. Be sure to multiply the width measurement by 2 so we can compare notes in the next step. Do this for all 3 garments. NOW, place the two pages of measurements you’ve taken side-by-side. First of all, you’ll notice none of the garment measurements match your body measurements at all. Put the CYCofA Sizing Chart next to the garment measurements and see if they are close to any of the sizes they give. Are they the sizes you thought they would be? TAKE A DEEP BREATH, and place your Body Measurement Page next to their Amount of Ease Page. VOILA! The measurement of your favorite pullover! Do the same thing with your shell and cardigan. Do we see a theme developing here? As in, what’s the secret to choosing the SIZE you need to make to actually FIT you? Your *SIZE* is the pattern size whose width measurement is closest to the width measurement of your similar, favorite garment! Your favorite garments are templates for the new, hand-knitted garments that you intend to make! Place your garment-in-progress on top of your favorite garment to check for size accuracy throughout the knitting process and you’ll have more and more successes under your belt in no time at all!